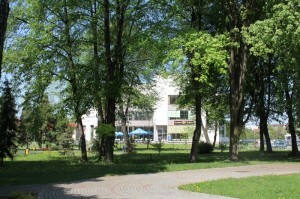 Brzesko – a commune in małopolskie province. Its parts are: the town of Brzesko, and nine villages: Bucze, Jadowniki, Jasień, Mokrzyska, Okocim, Poręba Spytkowska, Sterkowiec, Szczepanów and Wokowice. The oldest traces of man’s existence in this area date back to 3500 years. Brzesko was founded between 1344 and 1352 by count Spycimir, Kraków’s castellan. On 26 January 1385 Queen Jadwiga granted the town with Magdeburg Rights. Brzesko is a commune with the population of over 36 thousand inhabitants. The town has been the capital town of the District since 1998, and an important centre of industry and trade in the region. Over 2 thousand companies have their business place here. Brzesko region was lucky to be the birthplace of famous persons. Here St Stanislas Bishop and Martyr was born. In 1845 Jan Ewangelista Goetz, founder of the Brewery in Okocim came here. Ludwik Solski, great Polish actor, also lived in Brzesko, as well as Kazimierz Missona – dramatist and poet. Andrzej Munk, a well-known film director, often visited this town. Many routes and roads run in the Commune of Brzesko. Thousands of people travel these roads every day. Many of them, fascinated with the historical monuments, history or the town itself which becomes more and more beautiful every day, will certainly stop here for longer. If you want to visit friendly and optimistic people, we invite you to visit Brzesko. This entry was posted by Agnieszka Lechowicz, on czwartek, Lipiec 11th, 2013 at 20:10 and is filed under ANGIELSKI. Comments are currently closed.